Cardio Debate > Cardio Notes > Discovery > Coffee consumption and cardiovascular disease – What’s new? Coffee consumption and cardiovascular disease – What’s new? Coffee is one of the most widely consumed beverages on both sides of the Atlantic and the main source of caffeine intake in the adult population worldwide. Coffee is a rather complex drink as it contains several hundreds of compounds many of which exert powerful biological actions. A recent study by Poole et al (1) assessed the evidence available in the medical literature regarding the association between coffee intake and health outcomes. This was an “umbrella review” of existing meta-analyses of observational and interventional studies of coffee consumption and health outcomes. Umbrella reviews (2) represent a systematic search to evaluate existing evidence from multiple systematic reviews and/or meta-analyses on health outcomes. The authors searched for meta-analyses where coffee consumption was all or part of the exposure of interest. They assessed 201 meta-analyses of observational research and 17 of interventional research and found that coffee consumption was associated with benefit rather than harm for a range of health outcomes. As reported by Poole et al (1) the largest relative risk reduction was associated with intakes of three to four cups a day compared with no coffee intake. Beneficial effects were observed in all cause mortality (relative risk 0.83, 95% confidence interval 0.83 to 0.88), cardiovascular mortality (0.81, 0.72 to 0.90), and prevalence of cardiovascular disease (0.85, 0.80 to 0.90). Moreover, high versus low coffee intake was associated with an 18% lower risk of incident cancer (0.82, 0.74 to 0.89). Coffee intake was also associated with a lower risk of neurological, metabolic, and liver conditions. Although some harmful associations were identified in relation to coffee consumption, these were no longer apparent after adjustment for smoking. The authors state that there was no benefit in pregnancy, where “high versus low/no consumption was associated with low birth weight (odds ratio 1.31, 95% confidence interval 1.03 to 1.67), preterm birth in the first (1.22, 1.00 to 1.49) and second (1.12, 1.02 to 1.22) trimester, and pregnancy loss (1.46, 1.06 to 1.99)”. There was also a direct association between coffee consumption and fractures in women but not in men. 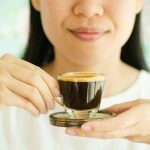 The authors concluded that coffee consumption is generally safe “within usual levels of intake”, with “estimates indicating largest risk reduction for various health outcomes at three to four cups a day”. Importantly, however, pregnant women and women at increased risk of fracture do not appear to benefit from coffee intake. The results of the Poole study (1) are in agreement with a state-of-the art paper published in 2011 (3) which concluded that from a cardiovascular (CV) standpoint, coffee consumption may reduce the risk of type 2 diabetes, hypertension, obesity and depression. The study also showed that although coffee may adversely affect lipid profiles “habitual coffee consumption is neutral or beneficial regarding the risks of a variety of adverse CV outcomes including coronary heart disease, congestive heart failure, arrhythmias, and stroke”. In agreement with these findings, large epidemiological studies suggest that regular coffee drinkers have reduced risks of both cardiac and all cause mortality. Moderate coffee intake has been shown to be beneficial in heart failure, stroke, arrhythmias, and dementia. Moreover, coffee has been suggested to have a protective effect against neurodegenerative diseases and asthma. The problem however is that most data on the actions of coffee on CV outcomes and other clinical conditions are based on observational data. Hence randomised, controlled studies to try and prove causation are needed. We should also remember that coffee intake is often associated with side effects that are directly related to the caffeine content and include anxiety, insomnia, tremor, palpitations and bone loss, with increased risk of fractures. Decaffeinated coffee intake may reduce these adverse effects. The results of the studies summarized above indicate that albeit there is no strong reason for physicians to indicate coffee consumption for health reasons, coffee intake is associated with many beneficial effects, except in pregnancy and in women with increased risk of fractures.